More than a decade ago, Simon Guy and Graham Farmer named the environment as "contested terrain," categorised the debated logics, acknowledged the legitimacy of interpretive differences, and called for a framework by which a plurality of voices might be heard, and a transformational process – toward "a very different dialogue about sustainable architecture" – might be effected. The sustainability conversation continues, as do the debates and differences, raising questions as to how "very different" the dialogue has become, and whether there remains a vacancy of communication and understanding that another framework might help to fill. This paper turns to the Christian theology of kenosis, and parallel concepts in other world religions, in order to reveal and posit a cross-cultural construct that, arguably, offers the potential for transformation of inter-logic engagement, as Guy and Farmer espoused. 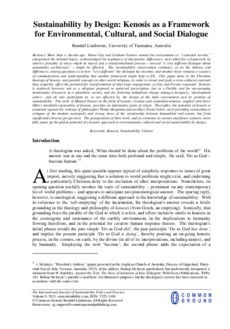 Kenosis is explored, however, not as a religious proposal or universal prescription, but as a flexible tool for encouraging hermeneutic discourse in a pluralistic society, and for fostering attitudinal change amongst designers, ‘development actors’, and all who participate in, or are affected by, the design of the built environment and its promise of sustainability. The work of Manuel Doncel in the field of kenotic creation and cosmobioevolution, coupled with Steve Odin’s interfaith exploration of kenosis, provides an informative point of origin. Thereafter, the potential of kenosis is examined against the writings of philosopher Walter Benjamin and architect Paolo Soleri, each providing extraordinary critiques of the modern metropolis and strong views of the relationship between humankind and nature, but from significantly diverse perspectives. The juxtaposition of their work, and its extension to current and future contexts, more fully opens up the global potential of a kenotic approach to environmental, cultural and social sustainability by design.